NANAIMO. COASTAL LIVING AT ITS BEST. As a vibrant harbour city, Nanaimo is the second largest urban centre on Vancouver Island. Steps to the shore and forested trails, Riverstone Place offers sweeping ocean views from its hilltop location and luxurious interiors in a walkable waterfront community. COASTAL LIVING AT ITS BEST. CENTRAL. VIBRANT. NATURAL. You can’t help but be drawn in by this ever-evolving city immersed in nature but still close to restaurants, a state-of- the-art hospital, university, boutique shopping and historic downtown. Riverstone Place is just a 5-minute walk to the waterfront. Go for an ocean paddle in the morning, golf in the afternoon, then stroll to a café for a beautiful evening meal. Getting to Nanaimo from the mainland is a breeze –either by sea or by air. Just a short 20-minute flight from Vancouver, Riverstone Place feels like a world away with its unique setting, fresh sea air, and abundance of recreational possibilities at your doorstep. Nanaimo has one of the longest shorelines in Canada and over 1,400 hectares of protected greenspace. The lush West Coast landscape, framed by scenic Mount Benson, includes parks, trails, world-class mountain biking, hiking, fishing, boating, waterfalls and breathtaking beaches. Take a stroll by the harbour, bask in the ocean breeze and discover the wildlife that calls Nanaimo home. Experience clean air, clear waters and a mild climate in a relaxed city that is a hub for Vancouver Island. Whether you’re an expert hiker or prefer an easy trail, Nanaimo is a hiker’s paradise. The city has miles of bike trails, making it one of the most popular spots on Vancouver Island for all levels of both mountain biking and urban cycling. With a population of over 150,000 the Regional District of Nanaimo is the second largest urban centre on Vancouver Island next to Victoria. Nanaimo was dedicated as the “Harbour City” in 1986. As a hub for the rest of the island, Nanaimo is an important gateway as well as a tourist destination and great place to live. As the site of the main ferry terminal, Nanaimo is the gateway to many other destinations both on the northern parts of the island and off its coast. 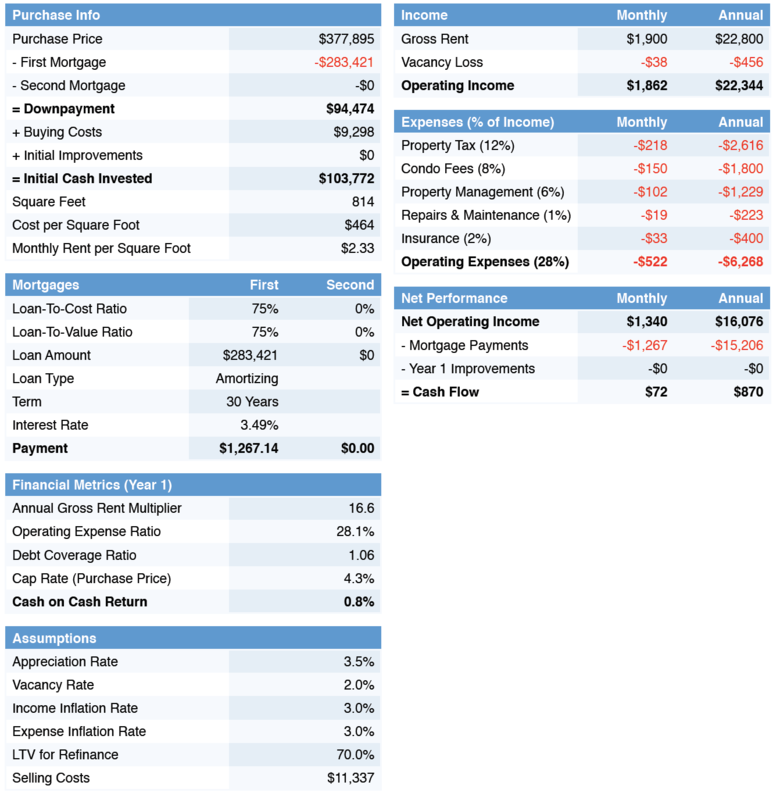 Nanaimo has a thriving urban centre within walking distance of Riverstone Place. Live just steps to a burgeoning craft beer scene, an eclectic mix of shops and the historic charm of the old city quarter. This sought-after community is also home to global and casual cuisine, family-run vineyards, comfortable cafes and neighbourhood pubs. 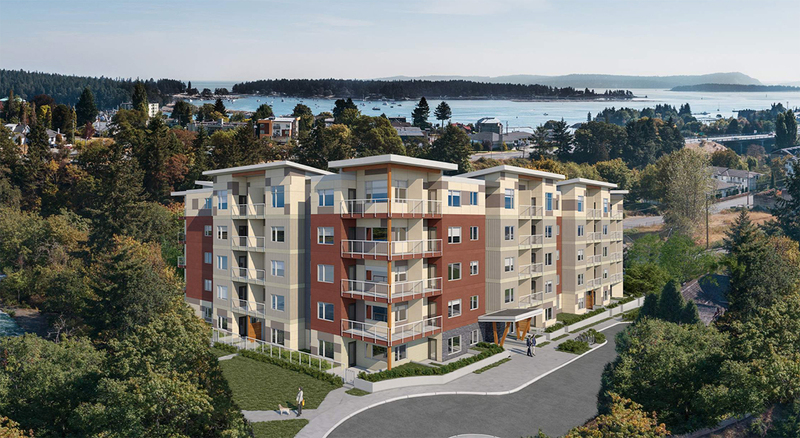 Riverstone Place comprises of a five-storey, 1 bedroom, 1 bedroom & den, and 2 bedroom homes rising above the waterfront and forested walking and biking trails of transforming Nanaimo. A vibrant harbour city, Nanaimo is the second largest urban centre on Vancouver Island. Impeccable interiors by Janet Hardy at Creative Spaces with three fresh, neutral colour palettes to choose from: misty grey, crisp white and soft maple brown. Each smartly designed home features spacious 9-foot ceilings, light-filled interiors, and expansive, functional closets with ample storage space. Soft, neutral carpeting adds warmth to bedrooms, while plank flooring flows from the kitchen to the living and dining rooms. Windows allow natural light to pour in and frame the tree-rich landscape and the breathtaking top-floor ocean views. Vaulted ceiling on select homes. Spacious, open-concept kitchens with European-inspired cabinetry. Modern, stylish quartz countertops and undercabinet lighting for bright countertop illumination. • Sophisticated under-mount stainless steel sinks with pull-out spray faucets for a contemporary feel. Designed for maximum relaxation with rain shower heads and single lever faucets. 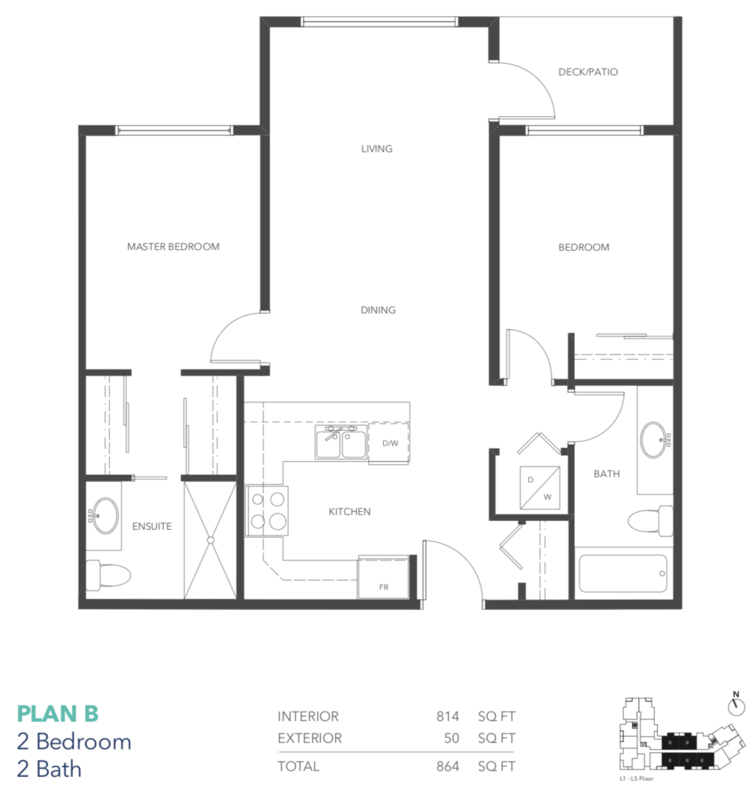 Ensuite includes luxurious Nuheat floors for optimal comfort in 2 bedroom homes. 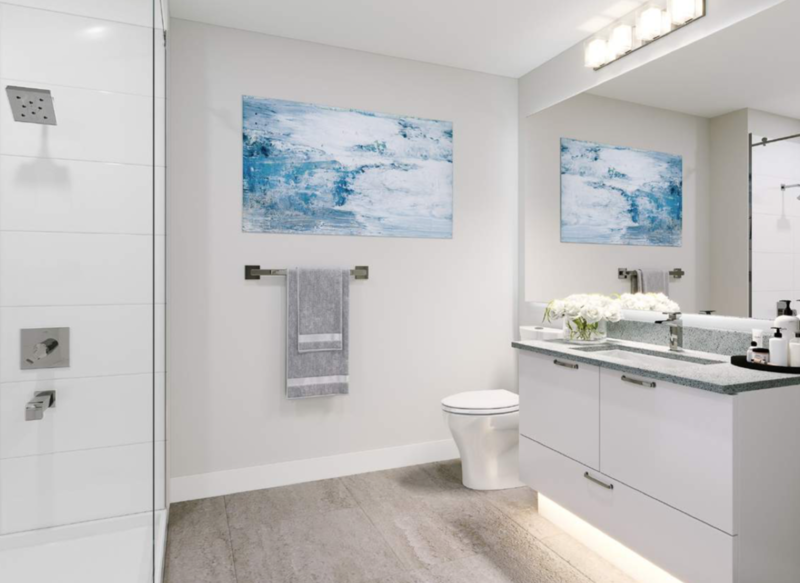 Contemporary white cabinets with ample storage for bathroom essentials. Vanity topped with sleek and stylish quartz countertops and under-mount sinks. Ensuites include polished mirror and vanity with under-cabinet lighting.